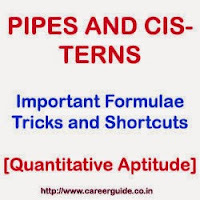 Here are important formulas and shortcuts to solve problems on Pipes and Cisterns. Basic knowledge regarding solving questions and problems on filling and emptying a tank with pipes in specific duration of time is important for various competitive exams like IBPS, SBI Bank PO, assistant, SSC exams, Railway exam, UPSC exams. A cistern is a water tank that has taps to fill or empty it. Pipes can be used to fill or empty the tank. Example 1: Two pipes A and B can fill the tank in 2 and 3 hours respectively. If both pipes are used together, then how long will it take to fill the tank? Solution: Using formula above both pipes can fill the tank in 2*3/(2+3) = 6/5 hr = 1 1/5. Example 2: A pipe can fill the tank in 2 hours and other pipe can empty itt in 3 hour. If both pipes are used together, then how long will it take to fill the tank? Example 3: Two pipes can fill a tank in 4 and 6 hours respectively while third pipe can empty it in 5 hours. If all three pipes are opened simultaneously in how much time will the tank be filled? Hence total time to fill the tank = 60/13 = 4 8/13 hrs. Example 4: Two pipes can fill a tank in 12 hours and 15 hours respectively. There is also a waste pipe which can empty the tank. When all three pipes are opened they emptied the tank in 20 minutes. How long will waste pipe take to empty the tank alone? Solution: Let third pipe takes X hours to empty the tank. => X = 10 hours. Pipes and cisterns practice sample paper -1 with detailed solution and answer key.